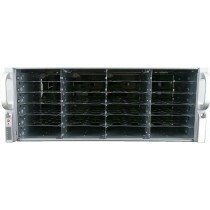 The SuperMicro CSE-848 is a compact 4U powerhouse system that is equally cost effective as it is quick. This Quad-socket refurbished SuperMicro Server supports E5-4600 and E5-4600 V2 series processors whilst allowing for installation of up to 1TB of RAM across 32 DIMM Slots. The flexible CSE-848 4U server makes a great large form factor (3.5") storage server at a great price. The SuperMicro CSE-848 fitted with a X9QRI-F+ Motherboard is a cheap 4U rack-solution for large scale database, data warehousing, big data, E-commerce and virtualisation / hypervisor applications. The X9QRI-F+ board briefly compromises of: Dual R Socket (LGA2011), Intel C602 Chipset, Quad Port Intel i350 Gigabit Ethernet, onboard KVM-Over-LAN, 6Gbps RAID Support and many more features. The CSE-848 is a Bargain Hardware favourite and a great addition to any expanding business. Only at Bargain Hardware can you configure every aspect of this refurbished SuperMicro CSE-848 to meet your price and performance requirements. From 3.5" SATA Drives to an array of Processors and expansion cards, every option is available to customize your system for any task.